With the Corsair K55 RGB, Corsair wants to retain an affordable keyboard for gamers in their line-up. It has a membrane keyboard which is now becoming less popular while mechanical keyboards are becoming more mainstream. 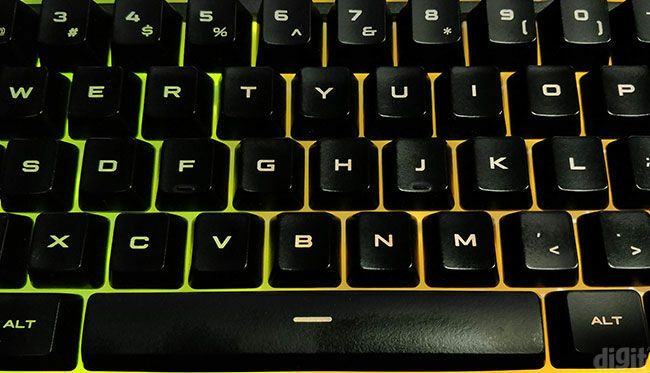 The K55 RGB packs most of the features you’d find on high-end Corsair keyboards. Features such as dedicated keys for multimedia playback and volume control are present on the top right. This means you don’t need to struggle by pressing two keys to control the volume. You’ll also find buttons to record macros on the fly, control the brightness of the illumination, and lock the Windows key. Macro recording is a great feature to have on a keyboard if you intend on using them in video games. Additionally, those macros can be assigned to the extra set of six keys present on the left. The keyboard sports a maximum key rollover of eight and that’s enough for gaming. We didn’t come across any erroneous ghosting on the keyboard. Software support is brilliant. You get the entire set of macro recording functionalities, including mouse clicks, available on other premium keyboards. 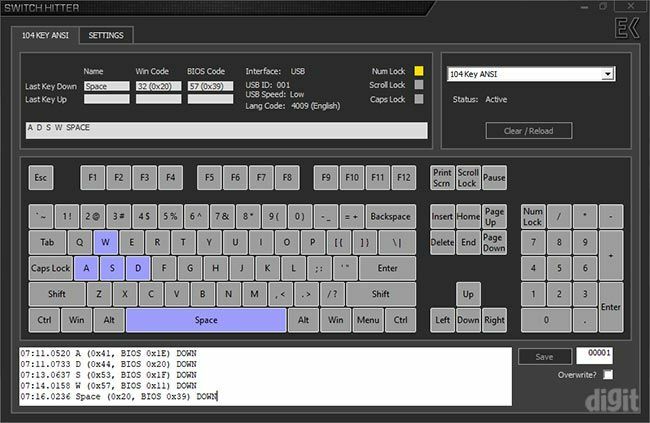 Lighting control is also included in the software, however, it’s limited since not much can be done because of the absence of pre-key lighting. There are some users who still prefer the mushy feel of using a membrane keyboard. The noise and tactile feel of a mechanical keyboard aren’t really appealing to everyone out there. If you’re among them, then it totally makes sense for you to go for a membrane keyboard. And if you’re looking for a really good option, the Corsair K55 RGB has all the premium features you’d want on a gaming keyboard. Apart from personal preference for a premium membrane keyboard, we don’t see any extraordinary reason for someone to opt for the K55 RGB. The prices of mechanical keyboards have been going down for a few years steadily. So much so that basic keyboards with mechanical switches are now available at the price of premium membrane keyboards. Some of these mechanical keyboards are sometimes sold at the same price. 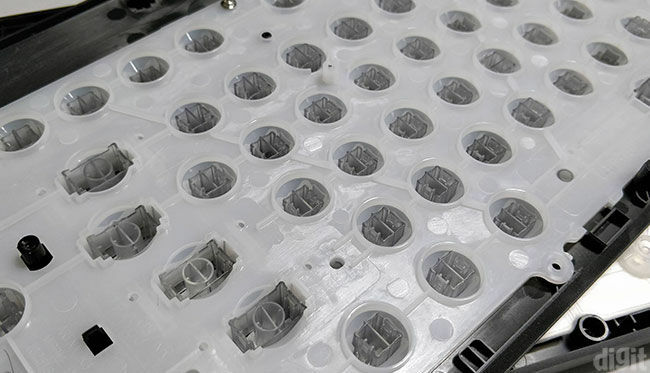 This has been a great development since Cherry’s patent for their mechanical switches expired and other manufacturers now had the opportunity to replicate it. However, membrane keyboards haven’t stopped coming out and they are still going strong. Of course, they don’t offer the same durability as their mechanical counterparts. However, they are still cheaper and they can incorporate the same features, software and hardware, except the durability. 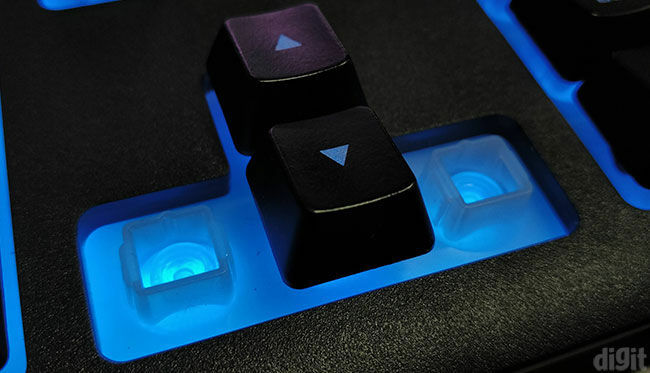 Corsair has a wide range of keyboards, membrane to mechanical, wired to wireless. With the K55 RGB, Corsair is trying to cater to the community which still prefers the feel and affordability of membrane keyboards. Their value addition is software support and few of the high-end Corsair features found on their keyboards. Naturally, the K55 RGB doesn’t come cheap compared to other membrane keyboards in the market. The question is should you still consider buying a membrane keyboard in 2018? Let’s find out. 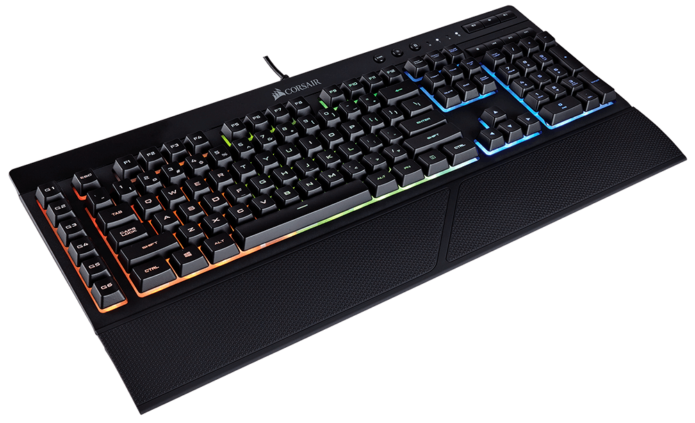 The Corsair K55 RGB packs a lot of features that you would find on other Corsair keyboards. On the top band, there are buttons to record macro combinations, change the brightness level, and lock the Windows button. Macro recording is available on the fly and they can be exclusively assigned to the six extra macro keys. Multimedia and volume control is present on the keyboard through dedicated keys on the top right. So, you can control music playback and the volume including a mute option using keys for each action. 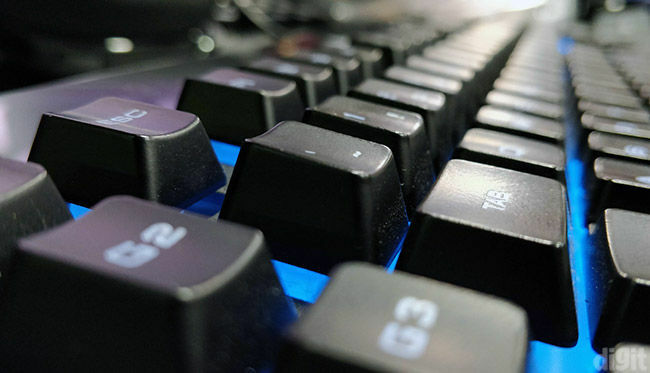 RGB lighting is present on the keyboard. However, it isn’t per-key lighting but present in three zones. This means you can’t control the backlighting individually on the keys. To change the lighting effects, you have to use the CUE or iCUE software. The product page mentions a minimum key rollover of eight. 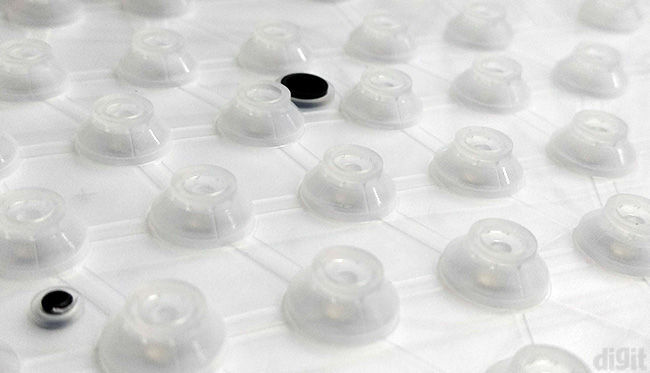 The K55 RGB is a membrane keyboard that uses the rubber dome design. When the keys are pressed, the stem of the keycap pushes down on the domes that make contact with the circuit. The keycaps are removable, making it easier to clean. Since they don’t have support for Cherry MX keycaps, you can’t replace them with third-party ones. For accessories, the keyboard only comes with a detachable wrist rest. It has a textured surface, reminiscent of the wrist rests found on other premium Corsair keyboards. It’s a good thing we are getting premium accessories on lower-end keyboards. However, this also means that the premium keyboards are missing out on better wrist rests, something seen only on the Corsair K95 RGB Platinum. Even though they charge a premium on their keyboards, Corsair doesn’t ship a keycap puller with their keyboards. Being an entry-level keyboard, the build quality doesn’t match up to other Corsair keyboards. 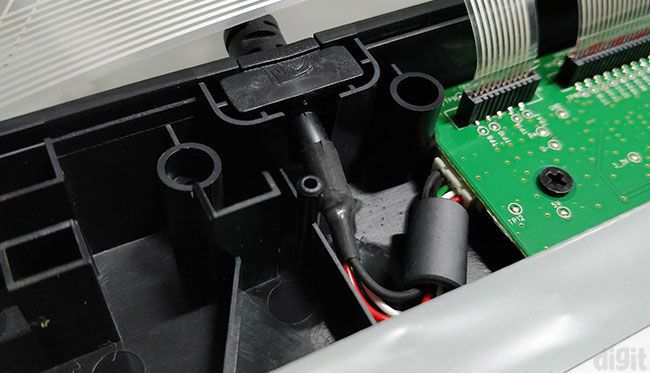 However, the better build quality on mechanical keyboards is necessary because of the extra and fragile hardware inside. 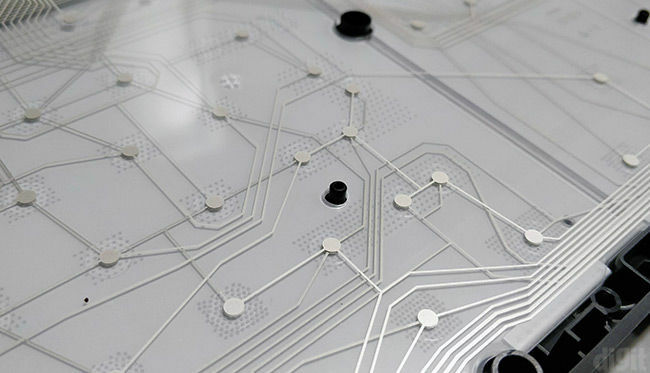 Whereas, on a membrane keyboard, you don’t really need a super strong chassis to hold the circuitry. The company manages to still pull off a flexible chassis that doesn’t creak while bending. There’s a textured finish on the surface around the keys made of plastic. The top band holding the other buttons and volume control has a glossy finish. 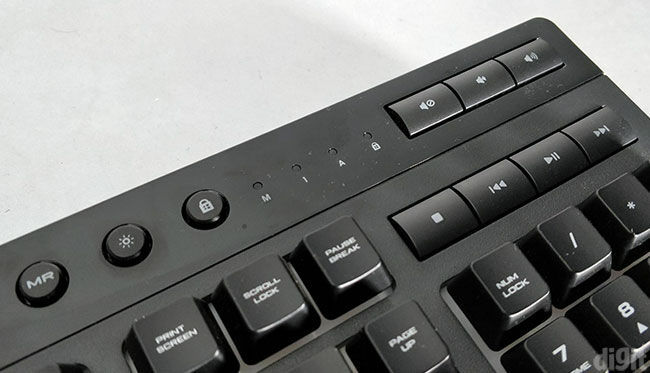 The keys have an OEM profile which means that the top function row doesn’t gradually curve upwards with the other keys. So, the function row is at a lower height compared to the curve of the other keys from the bottom to top. 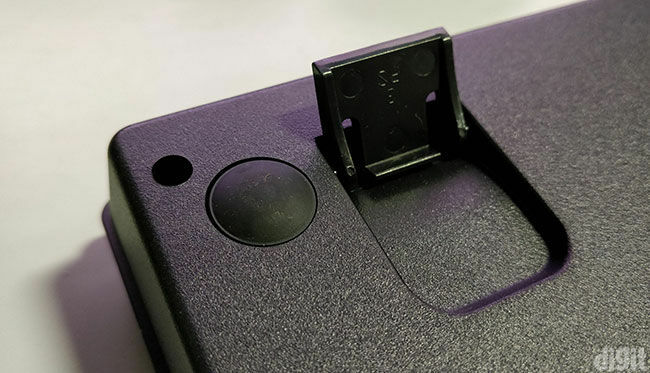 On the bottom, there are four rubber feet to prevent the keyboard from slipping on your desk. It also has plastic extendable feet with no rubber lining. At times, the keyboard does tend to slip when you’re furiously typing for a while. However, the two rubber feet at the bottom do offer some friction to keep the slipping to a minimum. The cable has a thick plastic coating ending to a standard USB Type-A connector. On the inside, we found good build quality as well. The cable was shielded well at the opening with some slack. So, even if you accidentally tug on the cable, you won’t be doing much damage to it. The top cover holds all the keycaps and you don’t have to take the pain of individually remove the keycaps in order to open the cover. Below the top cover, there’s a diffuser to uniformly spread the illumination. The membrane layer is separate and easy to clean. This is the layer responsible for making contact between the keys and the circuit. After a few years of usage, they usually tend to soften and flat out. Hence, the lower durability on membrane keyboards compared to mechanical ones. Even though mechanical switches suffer from chatter (multiple key presses for the same key), this error shows up way later. However, the membrane layer would have already flattened by then. Moving on, we reach the circuit layer sitting right on top of the bottom LED slate. The keyboard doesn’t incorporate per-key lighting. 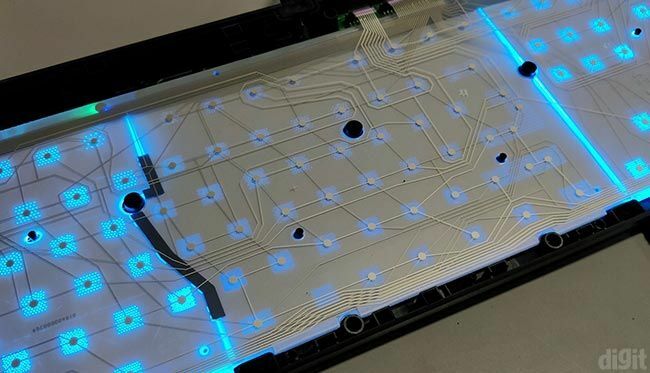 This means every key doesn’t get its individual LED for illumination. Instead, there are three zones that individually light up. 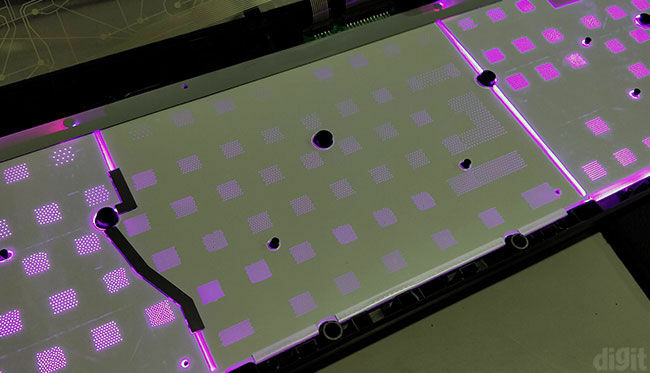 LEDs are present at the edges and because of diffusion across the slate, the entire layer lights up. The interior was clean and there weren’t any problems while taking apart the different components on the inside. Putting back all the different layers is easy and repairing the keyboard won’t be much of a hassle. 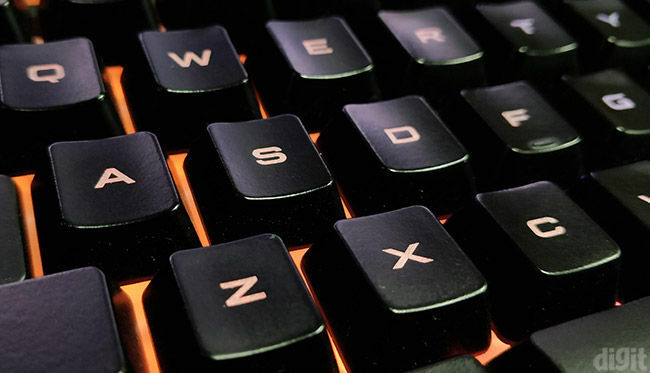 To test keyboards in gaming, we play games across different genres. The most tasking is usually FPS games where you have to press multiple keys simultaneously. Since there’s more than 3-key rollover, you aren’t going to face any issues of key presses not getting registered. We started up Switch Hitter to determine the key rollover and found it to vary based on the combination of keys. We were able to register a maximum of ten key presses simultaneously across different rows of the matrix. It’s always better to have some headroom in these cases. In the same software, we didn’t notice any ghosting by pressing different keys while multiple keys had been pressed. The WASD keys would register even when pressed simultaneously and that’s enough while playing games. Typing is completely subjective. It all comes down to what feels best to your fingers when you’re pushing down on the keys. Typing on membrane keyboards is more tiring since you’d have to press the keys all the way down to register a key press. Because of the absence of an actuation point mid-way, bottoming out the keys requires more work. So, your fingers tend to get fatigued early compared to mechanical keyboards. For some typists, the mushy feeling of pressing a membrane keyboard can be unpleasant. If you’ve fallen in love with typing on a mechanical keyboard, then you probably won’t consider going back to membrane keyboards. However, some might find typing on a mechanical keyboard unpleasant as well because of the noise and tactile feel. The early actuation point is also something people might not be comfortable. 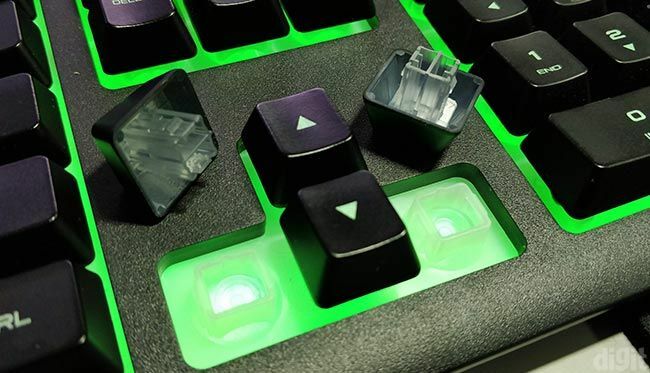 For us, coming back from a mechanical keyboard was slightly displeasing because we had to press the key all the way down while typing. Apart from that, we were able to achieve a good typing speed on the K55 RGB.